What is there to say about this skirt style that hasn't been said before? In all honesty, when it first hit the scene I wasn't the least bit interested, they were nice but I didn't feel that I desperately needed one. However when I realised they were similar to the wrap around dress, and knowing I'd have the joy of choosing a top half I quickly changed my mind. They really are flattering and let's not forget the food baby you hide with the genius wrap around style. I feel it looks flattering on anyone and you can really dress it up or down. I chose this one from Nobody's Child due to not being one for lots of colour but I loved the black skirt with red flowers as it really can make a plain outfit look quite put together. Unfortunately this one is in the sale and last time I checked they only had one size left. However, Topshop recently bought out a skirt similar to this one which will be linked here. It is however a blogger fave so selling out quick too so head down to your local store as quick as possible! I decided to pair the skirt with a black vest, black bag and the converse to give it a not so girly look as I'm not one to be super girly but like having a little girly look now and again. I also paired it with the belt to break it up a little as I just didn't like how it looked too much before adding it! 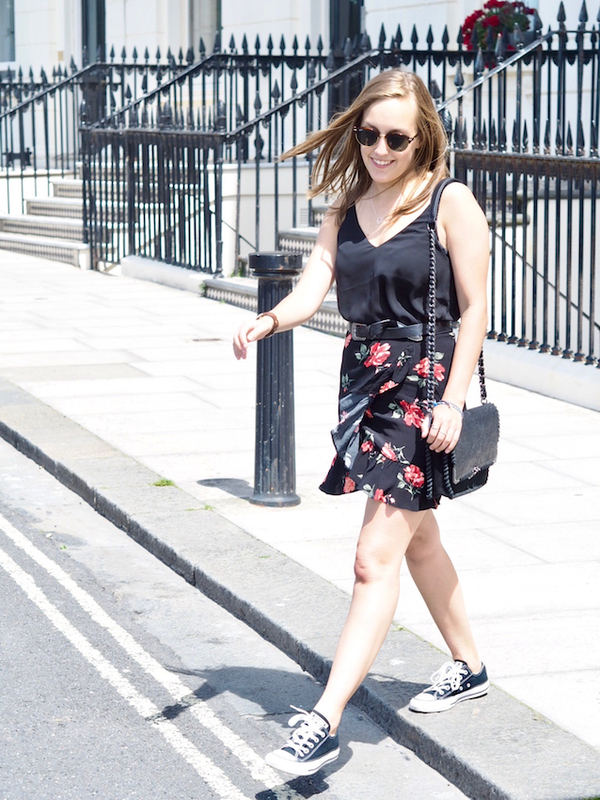 This skirt I will definitely be wearing till it get's cold, it really is perfect for summer! How do you like styling skirts? Photography by my lovely boyfriend! Really love this skirt !! And your shadesss, love the shape and frame.